Stiff Joint Easy Treat from Beaphar help to support the development and maintenance of healthy joints, tendons and connective tissue. Each treat is filled with a tasty paste that includes Collagen Hydrolysate and natural Glucosamine from shellfish and crustaceans, both of which are known to support joint mobility and promote cartilage re-generation in the long term. 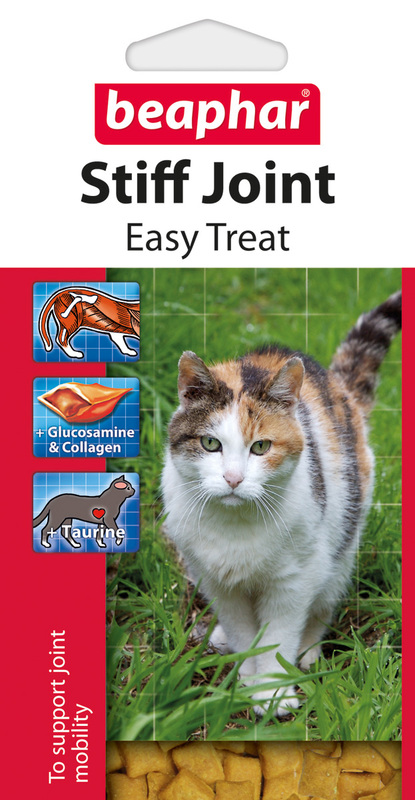 Below are some recent questions we've received regarding Beaphar Stiff Joint Easy Treat for Cats, including answers from our team. How many do you get in a pack and how often do they need to have one? Thank you for your question. You can feed up to 10 tablets per day and a pack contains approx 70-75 treats.